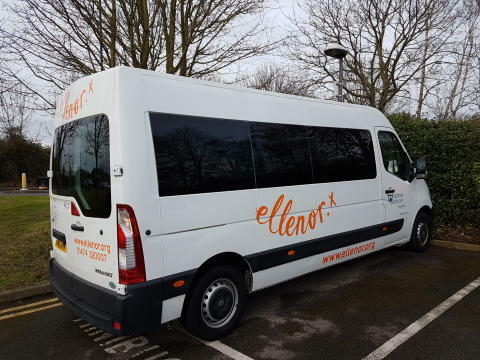 Staff at ellenor hospice, Gravesend were devastated to discover that on Tuesday evening, 30 January, thieves removed the catalytic convertors from the exhaust systems of two of their minibuses which have rendered the vehicles inoperable. This has meant that a large number of patients were unable to access the hospice’s day and well being services. The vandalism sparked an outpouring of support from across the local community, which supports patients and their families living with a terminal illness. Hundreds of kind messages and offers of help were received and showed a remarkable sense of community spirit and the high regard in which ellenor is held by the local community. People come to ellenor for a range of support, which is open not only to patients facing a terminal illness or a life-limiting condition, but also to their families. Volunteer drivers use the specially adapted vehicles to collect patients in the community who may be very ill, have mobility problems or might be elderly or frail and bring them to ellenor for Day hospice care and other services. “We have been overwhelmed by the generosity of our local community, and their passionate support to ellenor. We raised an incredible £10,000 and would like to offer our sincerest thanks to everyone in the community who donated to our Just Giving page enabling us to continue our vital care - their generosity will make a real difference. Both minibuses are now back on the road and will enable us to offer ellenor patients improved access to our personalised care. We also would like to take this opportunity to thank ProtectAVan Brentwood, Mr Clutch Gravesend and Northfleet & Windmill Masonic Lodges” says Jacquie Hackett Director of Patient Care. ellenor is committed to providing quality care and support to both children and adults in the hospice and in the home, while enhancing comfort, dignity, choice and quality of life. The hospice supports patients for the duration of their illness, continuing on with the surviving family with bereavement support. The hospice serves all members of the community who have a life limiting or terminal illness with no fee for any services.